Fighting games have a weird history on the App Store. Big names like Street Fighter and King of Fighters are present, and mostly looked to emulate their arcade counterparts by way of a smattering of virtual buttons on the touchscreen. The original Injustice (and to an extent, Infinity Blade before it) was the first to try to take the elements that make fighting games great but adapt them to touchscreen friendly taps and swipes. Many of these “streamlined mobile fighters" have come in its wake, trying to expand upon and hone in on the formula. While I’ve enjoyed many of those games for years now, I feel like Skullgirls (Free) is the one to have nailed that streamlined formula the best thus far. For a quick history lesson, Skullgirls originally launched on consoles in the spring of 2012 and stood out for its largely female cast of wacky characters, its postwar setting and jazzy soundtrack, and its gorgeous hand-drawn sprites and incredibly fluid animations. In a world of 3D polygonal fighters, Skullgirls was a throwback to the classic fighters of the ’90s. The game was highly acclaimed and spawned a few different versions over the years across a variety of platforms. 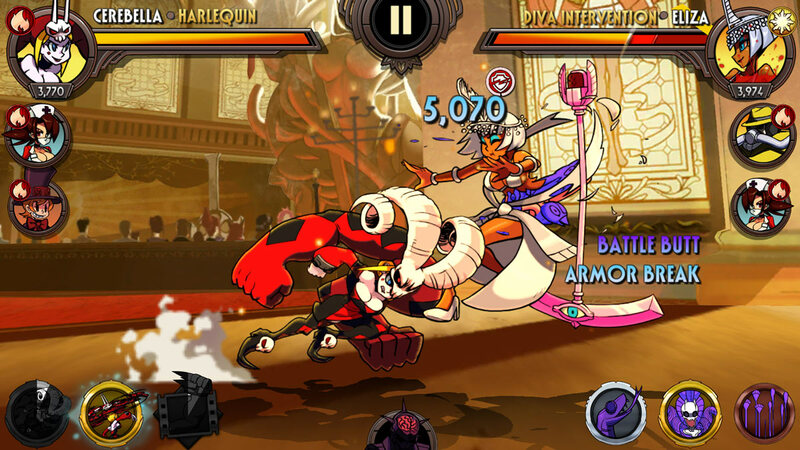 Skullgirls on mobile is very true to its older siblings and carries over many of its unique characteristics, which already makes it stand out from the pack of similar games on the App Store. What really gets me about Skullgirls on mobile though is its fighting mechanics. Other streamlined mobile fighters get the timing and anticipation aspects of traditional fighters down well, but the actual back and forth fighting typically feels more robotic and canned. There’s some essence of that in Skullgirls too, just by nature of it being stripped down, but it also retains a ton more of the strategy and the organic feel of traditional fighting games. You have a lot more choice in how you attack and chain together combos, and they’ve even found a way to include important elements like throwing and air juggling into the more compact form. It’s just damn fun, and makes it hard to go back to Injustice, et al. My main knock on Skullgirls is that the difficulty balance is a bit all over the place. This is lessened by the fact that there’s so darn much to do in the game, between the multiple branching paths and multiple difficulty levels of the Story campaign, to the Daily Events, and especially to the Prize Fights which are more or less the PvP arenas in the game. You’ll no doubt hit points in any of these modes where you’re up against an absolute beast of an opponent and get your knickers handed to you, but it’s easy enough to shuffle off for a while and find some other things to do in the meantime before approaching that opponent again with a different strategy or a more leveled up team. Another neat aspect, and something that’s worth noting when facing off against any opponent, is the whole elemental system. Each character is a certain type of element, and there’s the typical rock/paper/scissors effect with fire/water/earth elements plus a light and dark element which are strong against each other. It is imperative that you pay attention to this as it can easily make a seemingly impossible fight practically a cakewalk if you have the right elemental balance towards your opponents. If you haven’t been paying attention to this and feel like you’ve come across some absurdly difficult opponents out of the blue, then check the elemental matchups, as that could very well be the issue. Anyway, I’ve written a bunch about Skullgirls already leading up to and through its release, and I feel like I could just harp on forever, but you’re all probably anxious to get your weekend started. 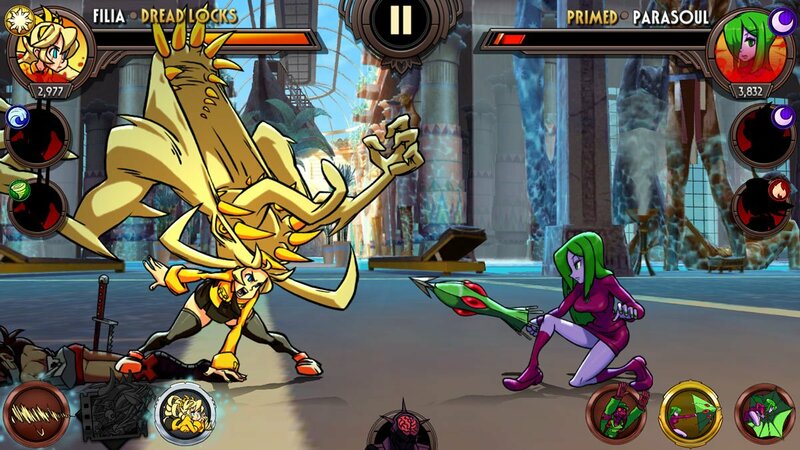 Hopefully I’ve made the case as to why I think Skullgirls is such a standout in this crowded mobile fighting genre, and with its unique look and wonderful mechanics, I hope that fighting game fans and non-fans alike will give the game a shot and drop their impressions in the forum thread. Hopefully, like Injustice and Marvel CoC before it, Skullgirls will be a hit and go on to see many years of life and fantastic updates.